Put a second phone and number on your smartphone with better call quality and lower cost than ever before. A Second Phone, in your Phone. Never carry two phones again. 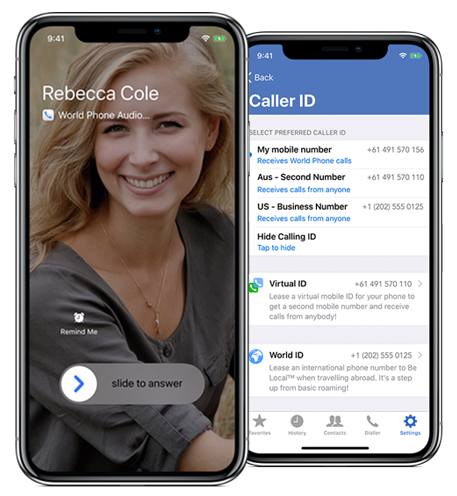 Protect your privacy and safety by keeping your numbers and, business and private calls separate, all on the one device. World Phone® is instantly familiar and beautiful to use. All your phone contacts are already there, so you’re productive from the first moment. Effortlessly rent a local number in-app, for travelling or to speak with your distant contacts and relatives. Numbers are available in more than 70 countries! When paired with the powerful Corona® Cloud platform for enterprise, World Phone® can do even more! Voice mail, call logging, and adding business-owned numbers, are just some features exclusive to corporate users. We want your experience on World Phone® and Corona® to be memorable. If you have any questions, have a look at the FAQ here for help.